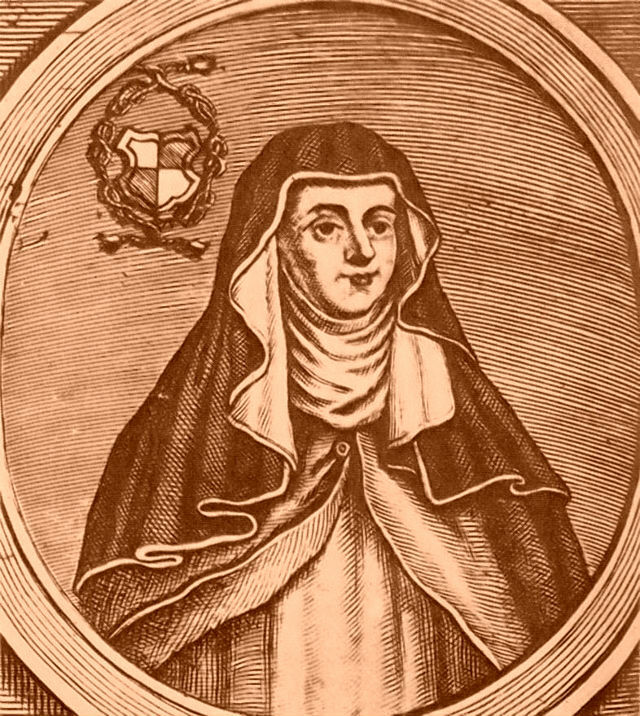 She preceded Hildegard of Bingen by two centuries, and obviously, we don’t know a lot about Hrotsvitha–not nearly as much as we know about, say, the founders of Tridentine-era religious orders. What do we know? She was a canoness–pretty sure. She was part of an “independent” abbey, separate from church or secular rule. She took vows of chastity and obedience, but perhaps not poverty. The abbess at Gandersheim encouraged Hrotsvitha to write, and so she did. Poems. Stories. History. And plays. We can surmise she was a scholar as she wrote in Latin and gave hints she was familiar with the classical works of a number of Roman poets. She seemed to have a thing about writing about female martyrs, or men who rescued women from a life of sin. She began writing about 968AD. She may have died in 973. Or 1002. Nobody knows for sure. Her literary works weren’t discovered until 1500, and we probably don’t have everything she produced. I, the strong voice of Gandersheim, have not hesitated to imitate in my writing a poet whose works are so widely read, my object being to glorify, within the limits of my poor talent, the laudable chastity of Christian virgins in that same form of composition which has been used to describe the shameless acts of licentious women. We know she defended her work from people who, a thousand years ago thought it absurd that a woman was capable of writing. She advised her detractors to chalk it up to the grace of God. Some modern people count her a feminist. In her day, she might have flown under the radar of nosy men. She might have been discounted entirely by church or by secular authorities. And we cannot even be sure her plays were ever actually performed. If they were, it might have been just for her community of religious women. She does have an asteroid named after her–which is likely more than you can say about any tenth-century men. Her story is also a marker for the Ottonian Renaissance of the 10th century. An old, hoary chestnut of medievalists is to pose the question of whether the Carolingian revival was the last gasp of Late Antiquity or the first of Western Europe – if one is inclined to the former (understanding that it was followed by the last great wave of centuries of migratory disruptions from Eurasia – and the Vikings), then the Ottonians (during whose dynastic era the great migrations ended) mark the first revival in the Western European story.